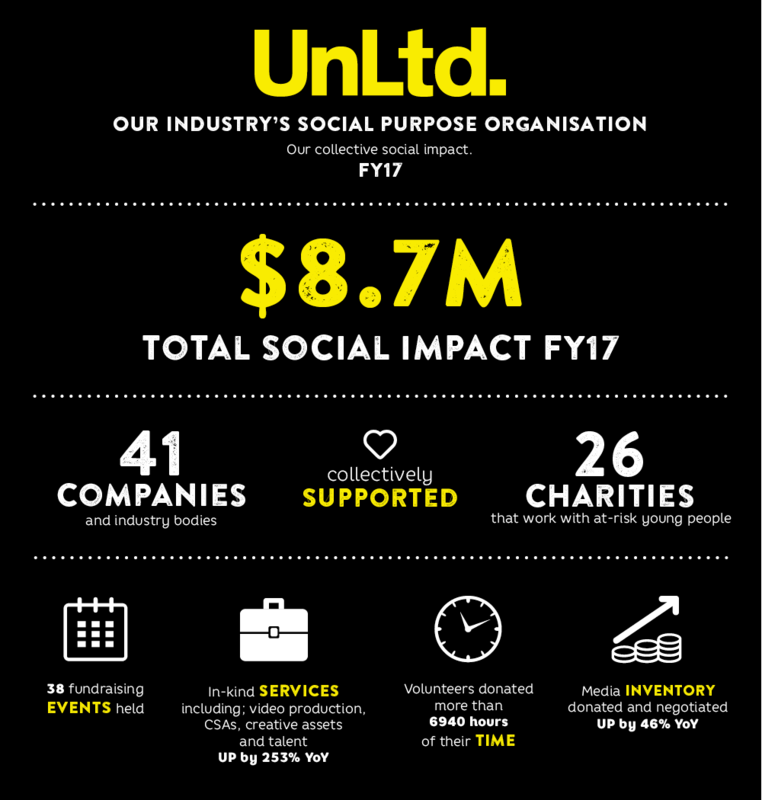 UnLtd has announced a record $8.7 million total industry contribution to social impact in FY17 as part of its annual results, released today. The total value of funds, services, inventory and time donated by the media, marketing and creative sectors increased by 34% from the previous financial year thanks to an increased number of corporate partners, introduction of new events as well as deepened engagement with core Social Impact Partners. UnLtd thanked the industry partners, sponsors and individuals who contributed funds, services, time and inventory to reach this incredible social impact tally. “To those 41 companies and the countless individuals who have contributed in the past year, we say unlimited thanks. Thanks for believing in our industry’s unlimited potential to change young lives, and thanks for your role in helping us support Australian youth charities doing vital work. “To date, UnLtd has generated over $35 million in value and our aim is to make that $100 million by 2021. We look forward to welcoming more Social Impact Partners on board in this financial year and encourage anyone in the industry to get in touch to find out how they can make a difference in young lives,” said Fisher. 38 fundraising events were held. Over 300 MFA NGENers dodged some balls and raised funds at the annual Dodgeball tournament resulting in $30,000 raised for Hear For You, supporting deaf and hard-of-hearing young people. The donations allow Hear For You run 17 workshops giving 100 deaf or hard of hearing teenagers an opportunity to ward off social isolation and move towards becoming more engaged and focused on achieving their personal life potential.